PC and Round Balls ? Thread: PC and Round Balls ? 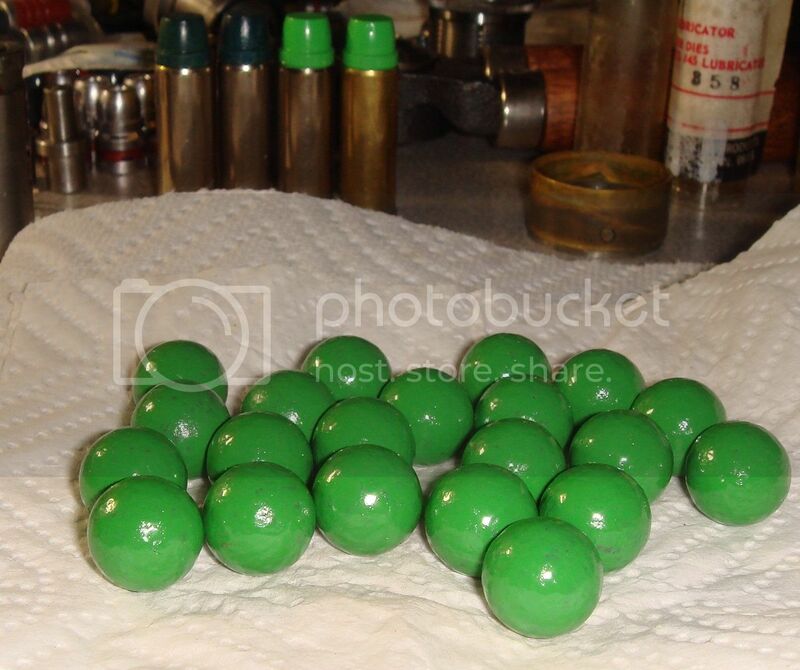 Has anyone experimented with PC and round balls in muzzle loaders? Or heard of anyone who has? I’m not planning to do so, I’m just curious? I have PC'd, Hi-Tek'd a lot for friends, they are happy with them. I Hi-Tek'd some round balls for my cap and ball revolver (only 'cos I could). They sure looked pretty but I can't see any advantage in doing it. If you're using patches in rifles then why would you bother? Leading is rarely a problem in muzzleloaders. What dikman says. I have thought about coating some REAL or Maxi balls but am somewhat concerned about the PC melting. I hear reports that BP will melt thru plastic shotgun shells and can cause "plasticing" (leading, only with plastic) when using plastic wads directly on top of the BP. Would still have to lube the bullets but would hope the PC would remove any leading worries. I did some for my rifle. No use to, as mentioned, since they ride in a patch, but it was fun to try. Normally, PC withstands more heat than lead. Not the same type of plastic as in shogun shells. When adding culls to melt, the lead melts and the PC floats on top. "PC keeps them from oxidizing" ----from Grmps. Reason enough for me. After finding "the load"
Wow, I never thought about that. PC'ing to differentiate between sizes. I use .451, .454, .457 have to cast them all separate. And be carefull to KEEP them separate. I don't see any advantage for revolvers. Properly sized balls have a thin ring of lead shaved off when they are loaded, so the coating would also be cut off leaving bare lead against the cylinder walls and the bore. I guess I can see a small advantage if you have a couple of revolvers that take slightly different ball sizes like a Colt navy vs. a Colt Walker, but that is about it. I PC cast buckshot after I have rolled them to make them round. Well if you powder coat, there won’t be any argument about who’s shot brought the game down!